Screenshot of an upcoming animation with the snow bunnies starring in it. This idea came from a collaboration un nuage d'ecole on vimeo who was working on Art&Science in her classroom. She had seen the snow bunny video and told me she had been using it in her classroom and on her school website. 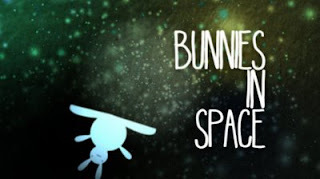 We talked and came up with an idea that the kids in her classroom could fantasize about the Bunnies in Space, as she was doing an astronomy project.